antitank warfare and engagement of point targets, is planned as armament for the TIGER helicopter. The system‘s most outstanding characteristics are its advanced vision system, fire power control and missile guidance technologies. The TRIGAT/LR system has a multi-target-engagement capacity and can perform salvo-firings against up to 4 targets even in electronic and electro-optical jamming environment. After target designation the missile homes in on its target autonomously (fire & forget principle). 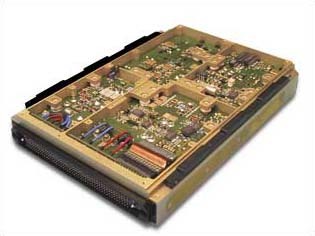 The power supply of the fire and control unit (FCU) is a customer-specific APCON product. More than 93% of the EEE-parts are SMD (surface mounted devices). 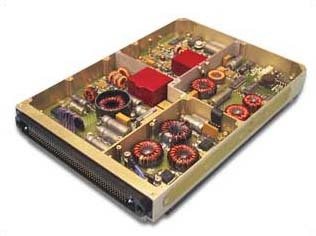 This APCON product uses high density design at very small dimensions. APCON is contract holder of the series production. Fixed frequency operation, remote sensing, overload/short circuit protection, ultra low dropout regulator, over-voltage protection and under/over-voltage control logic, over-temperature protection and power on reset. The input circuit is equipped with a 3-stage differential common mode filter to reduce the conducted emission (CE) and to control the conducted susceptibility (CS) in accordance to MIL-STD 462. 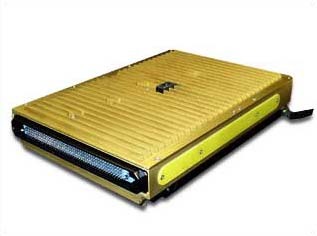 The unit is surge protected to meet MIL-STD-704D and EN2282. Inrush current limit at 15A with fold back characteristic. Main bus interface with on/off control circuit.